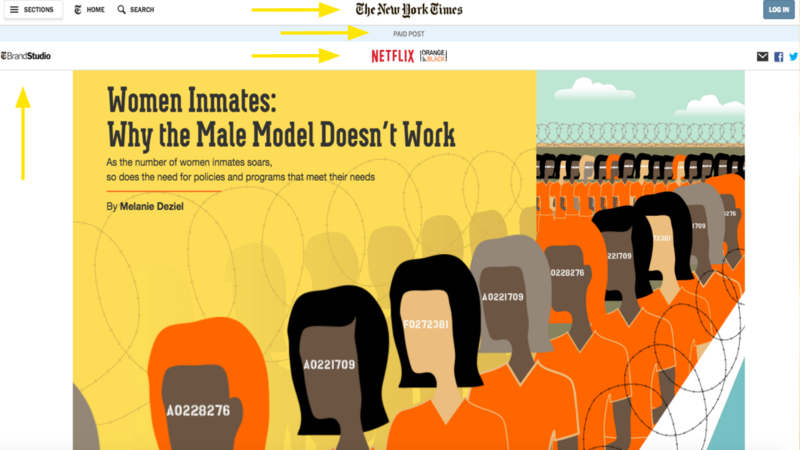 This is the first article in a series about native advertising, a complicated subject that we believe deserves in-depth treatment. 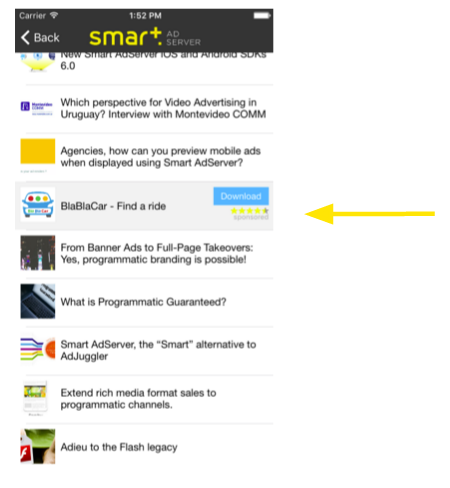 What’s native advertising? You probably think you already know. Most define it as publicity that blends into the look and feel of a publisher’s site, but which is paid for and/or written by a sponsor. That definition is spot on, but native ads encompass much more, come in many forms and can be placed into various contexts. All native ads serve the same purpose: to provide publicity for a product in a non-intrusive manner in order to reach a customer in a more “organic” fashion. Often both the brand and the publisher want to ensure the advertisement comes with added benefits and value for the reader. Native ads can come in any format, really (an article, a video, an infographic), and native advertising isn’t just online – its made it’s way to the big screen, too. But, not all native ads are the same. So, how do we distinguish one type from another? 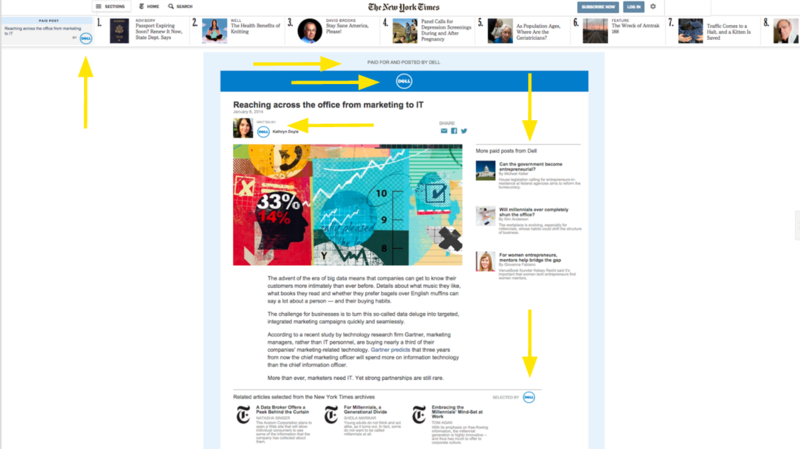 Two popular types of native advertising are sponsored content and branded content. Both are popular online — especially on news and magazine sites. Both contain a “sponsored content” label (or variation thereof) and the editorial style of the article matches that of the publication. Roadblocks or full-page takeovers may be set up to heighten brand recognition, but there isn’t a clear call to action. The difference between sponsored and branded content is quite simple: the former is written by the publisher for the brand, while the latter is written by the advertiser or brand itself. However, both share the same objective: to increase brand awareness. As you can see, the point at which the brand is highlighted can vary greatly. The third type of native ad that concerns ad serving is the advertorial, which allows publishers to take a slightly different approach. This form of branded content features a clear call to action and is designed to look like editorial content. (Hence the combination of the words “editorial” and “advertisement”.) Regardless of it’s form — article or video — the intent of the content is to encourage the reader to buy the product ASAP. 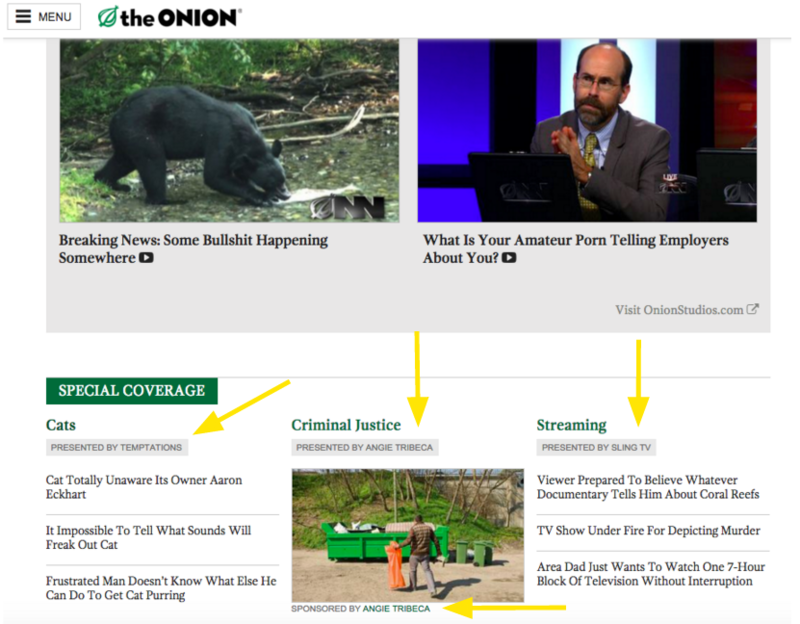 The Onion has got the sardonic advertorial down to an art form, creating advertorials and editorial videos that are strikingly similar in tone and appearance. If you have a minute, compare them to other videos by The Onion, many of which are not paid media, but very similar in look and feel. Product placement can also be classified as native advertising. The objective is the same as with other types of native ads, but rather than create an article or video around a product, the product is quietly slipped into an article, video or even a film. If you’ve seen the newest movie in the Rocky franchise, Creed, you know what we mean. The viewer is constantly reminded that the lightweight championship boxing match takes place at Everton soccer stadium, the logo of which appears everywhere during the fight scene. But the most prominent brand is Nike; rumor has it that there are over 160 Nike product placements in the movie! The protagonist played by actor Michael B. Jordan works out only in Nike and Nike Jordan gear throughout the entire film. And no, it’s not because he’s related to the Michael Jordan — the two stars haven’t even met. That’s all product placement. All in all, there are a host of paid media options out there if you want to “go native”. And the IAB has defined 6 different formats for native ads: in-feed, paid search, recommendation widgets, promoted listings, in-ad and custom. Publishers are certainly taking native formats seriously, as can be seen by eMarketer’s prediction that the industry will to hit $3.2 billion in 2017. But if you’ve been following native advertising, you’ve understood that there is a connection between native ads and ad blockers. In Part II of this series, we’ll discuss the link between the two by delving into the impact that both have on user experience.